Bittersweet Enchantment: Interview w/ Jennifer Estep, author of the Mythos Academy Series + GIVEAWAY: win a print copy of KILLER FROST!!! 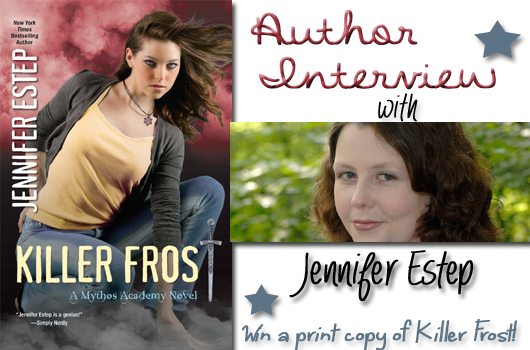 Interview w/ Jennifer Estep, author of the Mythos Academy Series + GIVEAWAY: win a print copy of KILLER FROST!!! OH. MY. GOODNESS! I am so beyond ecstatic about sharing this post with you guys. 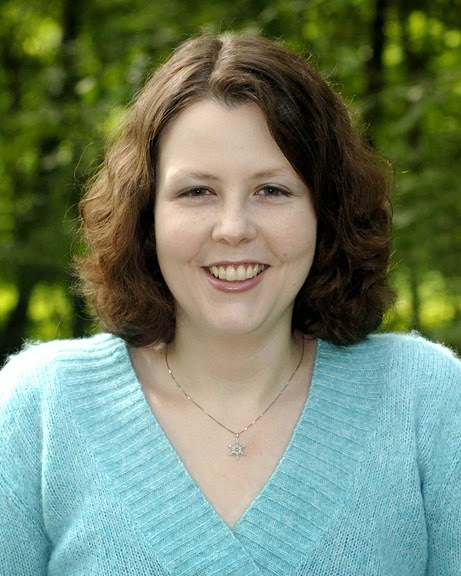 Today I am super honored to have one of my very favorite authors on the blog today. Jennifer Estep author of Mythos Academy series has agreed to be interview and host a giveaway for the FINAL novel in the Mythos Academy series, KILLER FROST! Enjoy and be sure to enter the giveaway at the end of this post. For all other purchasing options, click here. Find out more info on the entire series here & add them to Goodreads here. Me: Where did the idea for the series, The Mythos Academy come from? JE: I’ve always enjoyed mythology and reading and watching all the stories about all the gods, goddesses, warriors, and creatures and all the adventures that they have. One day, I thought it would be fun to write my own mythology story and put my own spin on the gods, goddesses, and more. So that’s sort of where the Mythos Academy series came from. Me: Have you always liked mythology and what's you're favorite God or Goddess? JE: I have always liked mythology. I don’t know that I have a favorite god or goddess, but I’ve always liked the myth of Cupid and Psyche because it has a sort of fairy-tale quality to it. Plus, it has a happy ending, and I always enjoy those. JE: Thanks! I appreciate that. I actually really like Vic because he says exactly what’s on his mind. He’s just a lot of fun for me to write. Me: Can you tell us, how many more books are to come in the series? Will there be any future novella focusing on certain characters? JE: Killer Frost is the sixth and final book in the series. It will be released on Feb. 25. I’ll never say never, so I might revisit the characters/series in the future, or maybe even do a spinoff if I have a story idea that appeals to me. But for right now, Gwen’s story is finished. I hope that readers enjoy the conclusion to the series. Me: All throughout the series, Gwen just can't get cut a break. There's always someone after her who wants her dead. Can you tell us (even give a hint) will Gwen EVER see a happy tomorrow? JE: Well, I can’t say too much about Killer Frost, but I do hope that fans of the series will enjoy seeing how Gwen faces some of her biggest challenges yet. Me: Books being made into movies right now is a HUGE thing! If given the opportunity, would you want The Mythos Academy being turned into a movie or TV show? If yes, who do you see playing some of the main parts? JE: I think it would be really cool if my books were turned into a movie or TV show. Maybe it will happen someday. Fingers crossed, anyway. I think someone like Emma Watson would be cool for Gwen and maybe Ian Somerhalder for Logan. Me: As an author you write both YA and adult fiction. Do you prefer to write one over the other? Also, as a reader, what types of books do you enjoy reading? JE: I really enjoy writing in both genres. All of my books have some of the same elements – strong heroines, magic/world building, and action/fight scenes. With my YA books, I get to tell a little more of a coming-of-age story with a heroine who’s figuring out who she wants to be. So that’s a fun story for me to write. I enjoy reading lots of different genres – all kinds of fantasy, all kinds of YA, romance, spy thrillers, mysteries, westerns, etc. Me: Here's a fun question: If you somehow got stranded on a deserted island with one fictional character from any book, who would you choose? Why? JE: Good question! I would probably pick Hermoine from the Harry Potter series. She’s so smart that she would definitely figure out a way to survive. Me: Gwen has an amazing special ability as well as her friends at school. If you could have one of these many abilities, which one would you choose? Why? JE: I think it would be cool to be superstrong like Daphne and the rest of the Valkyries are. Me: Is there anything else you'd like to say or shout out to the readers of my blog? Final thoughts? JE: Thanks for hosting me on your blog. I appreciate it. I hope that everyone enjoys Killer Frost and reading about Gwen’s latest adventure. Happy reading, everyone! 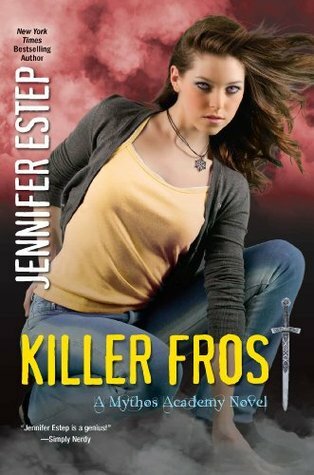 Jennifer being the awesome-amazing-epic author she is has offered to giveaway a print copy of the final book in the Mythos Academy series, KILLER FROST! Open to US only and ONLY for Bittersweet Enchantment readers. Caro -- Thanks! I appreciate that. Glad you are enjoying my books. This is one of my favorite series and I'm so excited for the next book!!!! Ash36 -- Thanks! I appreciate that. Hope you enjoy the book. Oh, and Hades is my favorite God. I haven't read this series yet. I have heard very good reviews. I need to get get started. My favorite Goddess is Athena. What can I say, she is the goddess of wisdom. I love Jennifer's other series and I'm so excited cuz I'm just getting started on this series :) I love the concept behind it and congrats to Jennifer on the newest release! I have not started this series yet but it is on my list to start very soon! I have a couple of the books on my shelf. I have not read any of the series yet. I am thankful for the opportunity to win; I love being introduced to new authors and series!